An analysis of a Mars rock sample by the Curiosity rover has unveiled minerals that are the building blocks of life, NASA said Tuesday. 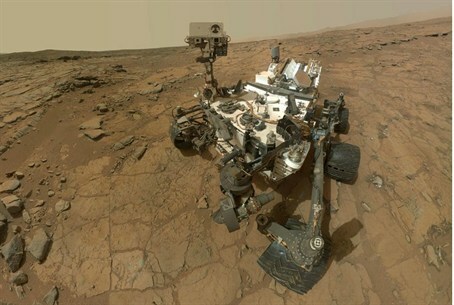 An analysis of a Mars rock sample by the Curiosity rover has unveiled minerals, including hydrogen, carbon and oxygen, that are the building blocks of life, NASA announced Tuesday. "A fundamental question for this mission is whether Mars could have supported a habitable environment," said Michael Meyer, lead scientist for NASA's Mars Exploration Program, according to AFP. "From what we know now, the answer is yes." The six-wheeled robot, with 10 scientific instruments on board, is the most sophisticated ever sent to another planet. The rock sample was drilled from a sedimentary bedrock sample and found to contain clay minerals, sulfate minerals and other chemicals. Based on the analysis of those chemicals, researchers were able to determine that the water that helped form the rocks were of a relatively neutral pH. "We have found a habitable environment that is so benign and supportive of life, that probably if this water was around and you had been there, you would have been able to drink it," said John Grotzinger, Curiosity project scientist from the California Institute of Technology, according to AFP.